Potato casseroles are a low-cost, hearty option that goes with just about any main dish you want to serve. Whether you're looking for an idea of what to serve with beef, poultry, pork, or seafood, it's hard to find anything better than a delicious potato casserole. Just add a green salad and/or a vegetable and you'll have a complete meal that everyone in your household is sure to enjoy. This recipe is a great way to use up left-over baked potatoes, although you can bake potatoes just for the purpose of preparing this delicious dish. Cook the bacon in a pan, oven, or microwave; drain and break into small chunks. Cut the potatoes into approximately one-inch chunks and place them in a bowl. It does not matter if the potatoes are cut warm or cold. You can leave the skins on or peel them prior to cutting - whichever you prefer. Slice the green onions and place them into the bowl. Add the sour cream to the bowl. Set aside approximately one-quarter of the bacon and cheese; add the rest to the bowl. Stir gently to combine. It is fine if the potatoes crumble or smoosh a bit, but you don't want to stir so hard that you end up with the consistency of mashed potatoes. Spoon into a 13" by 9" casserole dish that has been coated with nonstick cooking spray and spread mixture evenly in pan. Sprinkle remaining cheese and bacon across the top of the mixture. This casserole can be made with previously baked potatoes or uncooked ones - simply adjust the baking time based on what you choose. Cut the potatoes into approximately one-inch chunks and place them in a bowl. It does not matter if they are warm or cold when you cut them. You can leave the skins on or peel them, depending on your preference. Add all other ingredients to bowl. Spoon into a 13" by 9" casserole dish that has been coated with nonstick cooking spray, being sure to spread mixture evenly in pan. If the potatoes are uncooked, bake for 1 ½ hours. If they are cooked, bake for 30 minutes. There are a number of other potato casserole options for baking in the oven. 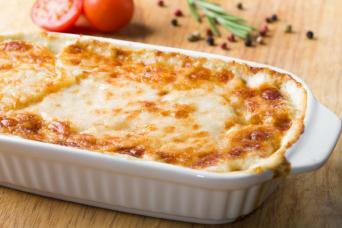 Scalloped potatoes or a hash brown potato casserole makes a great side dish. If you're more interested in baking a complete one-dish meal, consider making a hamburger mashed potato casserole. 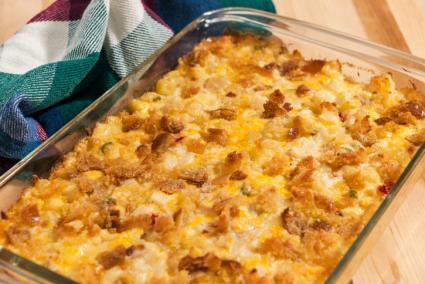 These potato casserole recipes all provide a great way to add some flavor to your favorite meals without breaking your budget!